Jewelry from far, far away! All the way from Bremen, Germany from a pet- and smoke-free home. I’ll keep adding items as I find or make them. I'm always happy to make a custom necklace or pendant for you! All items will be sent via registered mail so there will be tracking provided for most countries (USPS for example is very good about it!) – but this also means that they will have to be signed for on delivery. 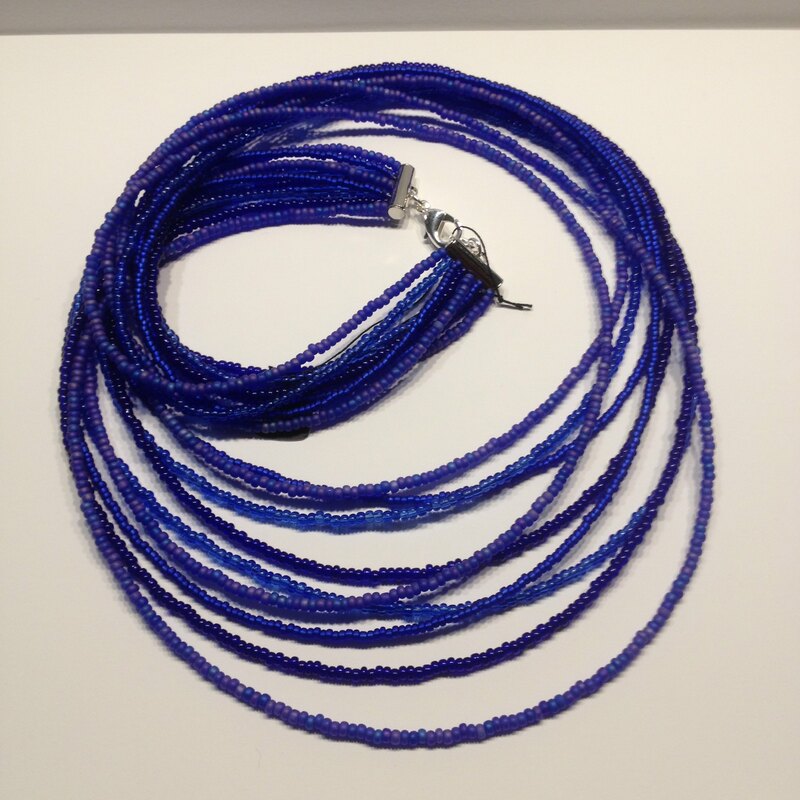 These necklaces are a very comfortable 53cm/21" along the shortest strand and 65cm/22.5" along the longest strand. Silver plated lobter clasp (I can change that for you easily), the tube thingies are at least free of nickel and cadmium. 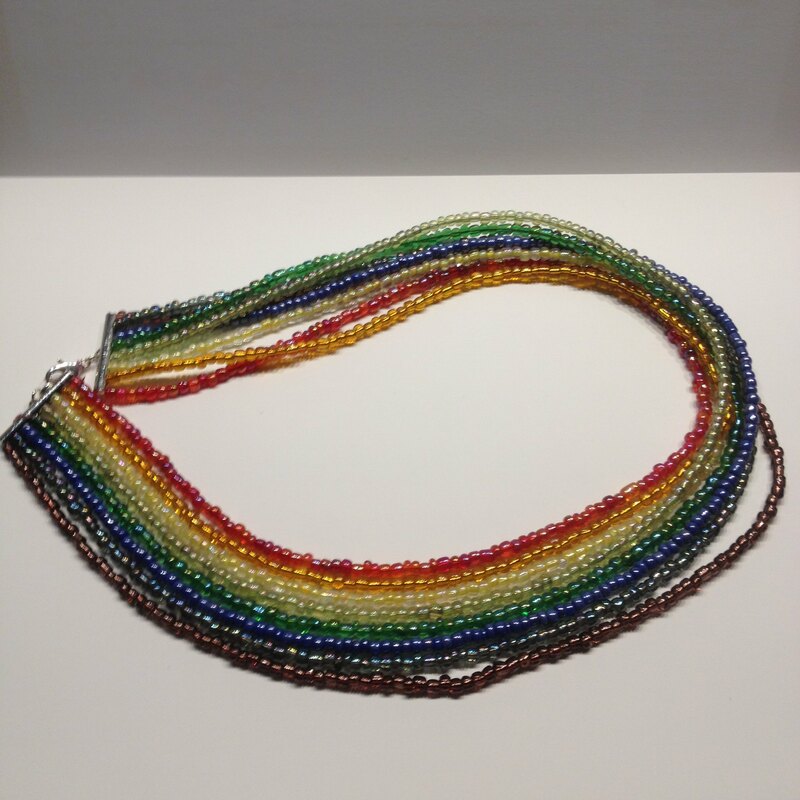 This one is a little shorter and has only 8 strands of 5mm seed beads. 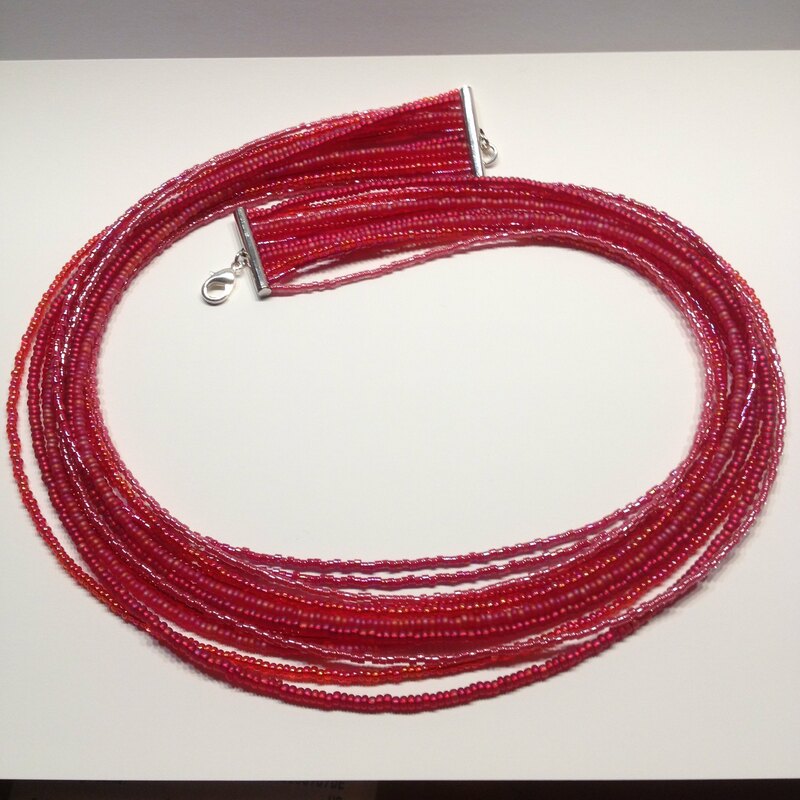 clasps and lengths as pictured, cm more accurate than inches! Many more shortish ones between 14 and 20 inches here sorted by colour! Will provide measurements for each. These are from my early days of beading, I'd say from 2004ish (I know I made lots during my honeymoon), mostly strung on linen thread (not stretchy). 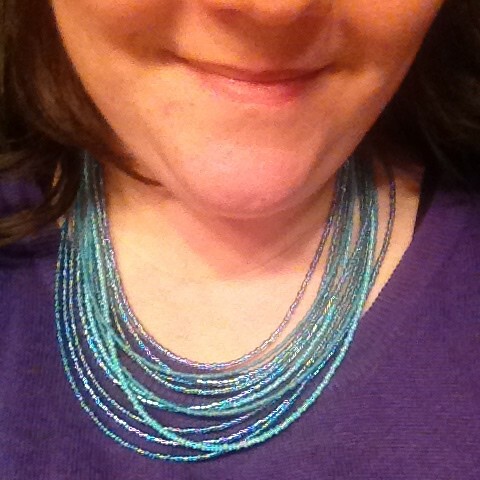 I've added pictures that show the lengths, the necklaces are in the same order in all pictures. Silver plated chain, clasp, headpins with purple & grey glass & crystal and metal beads (nickel & cadmium free according to my supplier). Longish. This is from 2014, so the silver is a bit tarnished already. I can also add to or reduce the length. This is a brand new bracelet, longish. Silver plated chain, clasp & headpins, various glass and crystal beads, skulls are "natural stone beads/imitation turquoise" (whatever that may be). Nickel & cadmium free again. Again I can also add to or reduce the length. Bird cabochons, two each available. Claim as square bird or round bird. Square cabochons: claim as green flowers, teal flowers, purple flower, purple damask. The solid, heavy settings are silverplated. These cabochons come with a silver plated chain necklace; brown, black or purple leather; or black, brown, pink, blue or green satin cord. Choose your clasp, either a silver plated or black regular lobster clasp, silverplated toggle clasp, magnet clasp. I also have a few heartshaped lobster clasps left! The length would is up to you, too. for a set of ten markers, 10 sets available. 5 sets for 1 point. Beads are 3-5mm, rings 8mm I think. Cabochons (pick 5 for .5 points or take all 12 for 1 point). Of course I can also make these into pendants/necklaces for a point! The cabochons measure about an inch across. I live in California with my husband, our two birds, and one cat. Please PM me with any questions or if you need additional photos! More items will be added! The purses are on interchangeable metal frames. The bottom of each purse is stiff and they all have metal purse feet. They all also have a small interior pocket and the straps are detachable. Claim mint critters (3 pts), or strawberries (3 pts). The mint critter measures about 5'' x 5'' on the bottom and the strawberries measure about 4 3/4'' x 4 3/4''. Both stand about 6'' tall. Needle felting in little terracotta pot. About 4 3/8 inches tall. They come on sterling silver ear wires. Choose: Pink heart ghosts, aqua bow ghosts, aqua heart ghosts, or black bow skull & crossbones. Made from a shiny glass star bottle that is about the size of a US quarter. 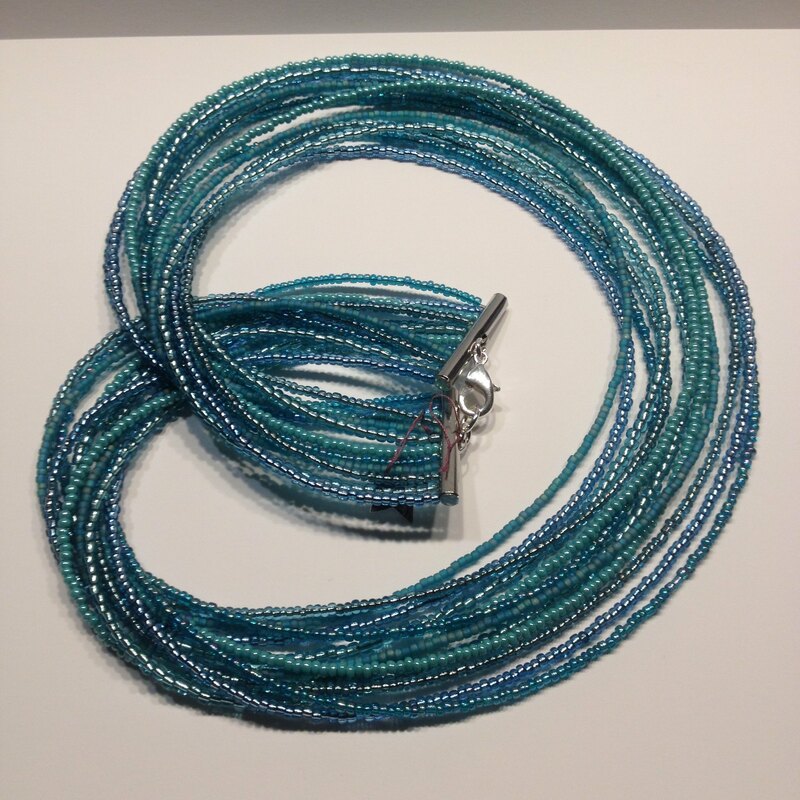 It is filled with mini glass beads and come on waxed cord necklace (adjustable from about 17''-19''). 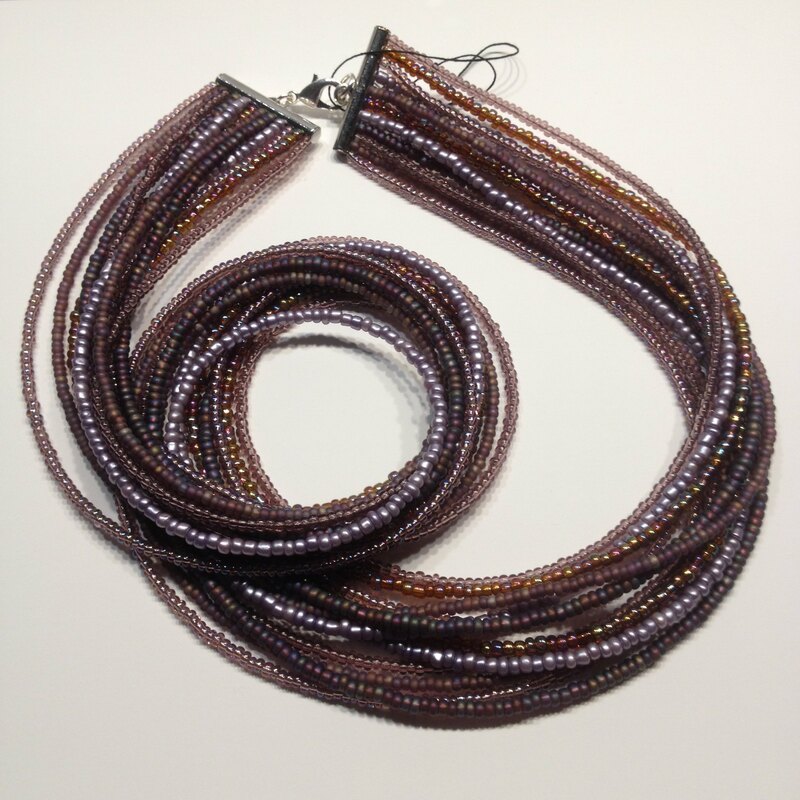 These are made from hollow hand blown glass beads (25mm) filled with glass seed beads. They come on a 18'' sterling silver chain. Choose gold, green, or red. Velvet with attached gems/charms at the ends. Top book mark and both leaf bookmarks have been claimed. All are used, but in good shape. I live in Michigan in the United States and have one furry dog. Although I attempt to keep her out of my craft items, it is inevitable that some hair has touched it! Mixed media monster artwork on 8"x8"x2" MDF cradle board. Great hanging pod bag for storage. Made with soft gray acrylic yarn. One more available. Hanging bag for storage made using hand-dyed cotton yarn. One available. Kwality monster on the outside with a blank inside. Comes in a set of 10 with matching envelopes (may be a different color than the teal, depending upon the amount of claims). Several sets available. Aqua monster only one left!! Mixed pack of 5 different stencils great for gelli printing or any other mixed media artwork. They are ones that I designed myself and cut out of transparency sheets using my Silhouette machine! Comes with everything included, but the cellophane on the outside ripped and fell off. Still in mint condition, however! Hello. I am Melissa from Northeast Pennsylvania. Mom of four (22 and 16) and twin boys (21 months). Love crafting all different mediums. Have an idea for a something different in my shop (custom keychain/necklace etc), just message me. As I may be able to do it for you. Mixed media magnets. about 1". strong magnets will hold several pages. web info book. each page has place to write login, password, important notes. 50 pages(100 sides). I can make as many as needed. Simple Faceted Crystal Necklace. 18" chain. Heart and crystal tassel necklace. 18" chain. Pendant hangs 3.75"
Swallow and Resin rose Necklace. 18" long. Pendant part hangs 1.25". Custom Keychain or necklace like ones shown in 1/2 pt section. Choose your favorite saying/song lyrics/picture. Have an idea, let's work on making it happen. Set of 10 wish bracelets. Assortment similar to shown. All individually packaged perfect for stocking stuffers, gift giving, etc. Send by 4/13/18 - thanate to mlsocci74 - 8 rose felties - 2pts. Hi! I'm Ann, in Maryland, crafter of all kinds of random stuff. All items from a house with a cat, but no other standard allergens that I'm aware of. Slightly used w/ slits at the back to thread on a ren faire style belt, closes by winding the ribbon in a figure 8 around the buttons. Chunky buttons! 3/point (made in sets of 6-12, so you may not get exactly the ones pictured here) Claim as heart, bell, tree, duck, 4-hole, blue butterfly (only 3 left) or green butterfly, dark teacups. Light teacups are down to the last good one; feel free to claim 3 mismatched if desired. Pink horse, "don't quit your daydream"
I can embroider on fleece (lots of colors), felt, or quilting cotton, and I have a few decorative papers left that I can do embroidery on also. Lots of thread colors. PM me with color requests when you make the claim & I'll see what I've got. Also feel free to reach out with questions before claiming. All of my items are crafted in a cat friendly, smoke free home. If you need more information about any of my items, please let me know! For any custom orders, PM me in advance to discuss details!! 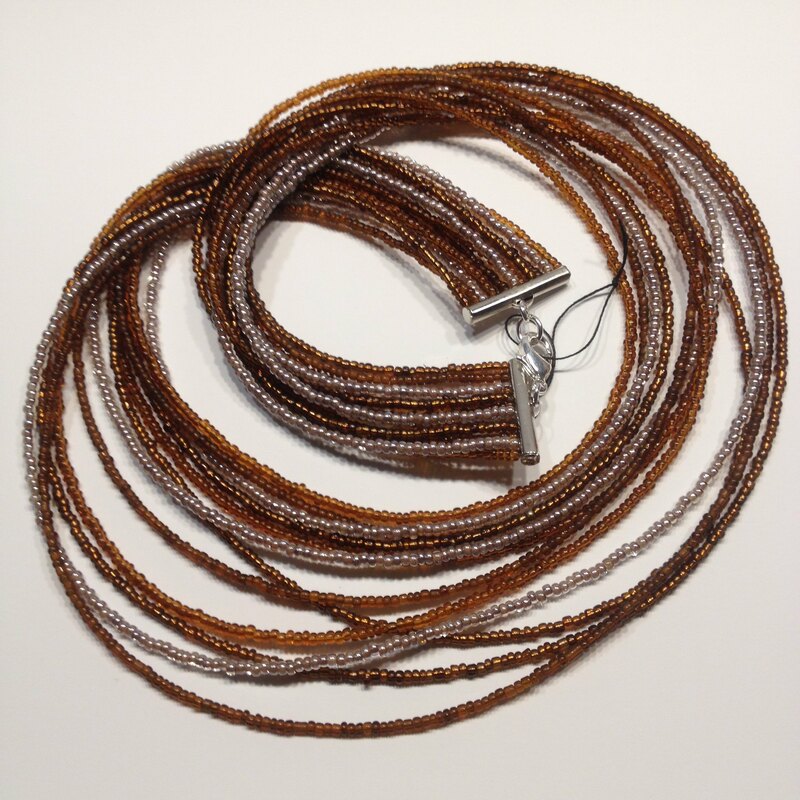 Copper Sequin Waste- TWO YARDS for 0.5 points. Lots available! Great for mixed media, stencils etc. All items crafted in a smoke-free, but bird friendly home. Please send me custom image for your label or I can find one if you tell me what you'd like. custom buttons five 1" buttons for 1 point or five 1.5" for 1 point or two 2.5" buttons for 1 point. custom buttons two 2.5" buttons for 1 point. Lego pendants - 2 for 1 point or 0.5 points each. Samples below. Please contact me for actual combos. Lego ring- 2 for 1 point or 0.5 points each. Please indicate color. Not all colors available. Please ask before claiming. All mounted on adjustable, hypoallergenic bands. lego heart pendants - 1 points[/b] burgundy, yellow, black, grey, and blue available. Wishlist: hmm, fun items from Mexico, neat things that I can gift, will have to ponder this a bit more.